Telemetry studies can track daily movements and seasonal migrations of fish, with the use of surgically implanted or externally attached transmitters. Technological advances have produced miniaturized transmitters that can be carried by smaller fish like crappies, without limiting their movements. Transmitter battery life also is longer nowadays, extending observation periods from months to over a year. Telemetry studies on movement patterns and habitat use by crappies have provided the most detailed look yet into the lives of these fish. Among the most recent crappie tracking studies, fishery biologist Ryan Oster of the Kentucky Department of Fish and Wildlife Resources and a research team tracked both white and black crappies on Kentucky Lake, a massive reservoir on the Tennessee River famed for its crappie fishing. This study is unique in that it compares habitat use and behavior of black and white crappies inhabiting a single water body. "During prespawn, both white and black crappies were most frequently found on flats adjacent to primary and secondary channels," Oster explains. "The two species occupied similar habitats, though white crappies were located more often on deep flats (10 feet or deeper) than black crappies. River channels, both shallow and deep, were the next most utilized habitat for white (33 percent) and black (43 percent) crappies. Flooded shoreline brush and rocky banks did not attract either species during this period." During the Spawn Period, both crappie species moved from deeper water to flats less than 8 feet deep. Oster suggests that shallow flats adjacent to secondary creek channels were the most common habitat for spawning. 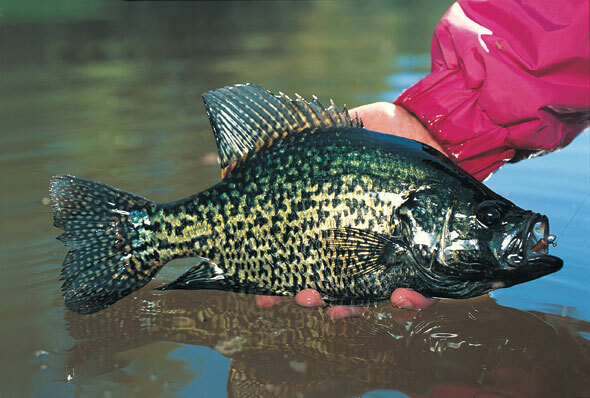 Black crappies made greater use of flooded shoreline brush than white crappies. "During the spawn, we often found black and white crappies along rocky banks, not a classic spawning location. Rocky banks rarely attracted fish except during the spawn," he says. Following the spawn, the differences in habitat preferences between species became most apparent. "Traditional wisdom at Kentucky Lake holds that, after spawning, crappies vacate flooded shoreline brush and other shallow cover and immediately move out to the nearest creek channel, ledge, or other major structure near spawning areas," he says. "There, it's believed that crappies undergo a brief postspawn recovery, followed by active feeding to replenish energy reserves. "Over the years, successful local anglers and guides have timed this migration effectively. Those who move with the fish often enjoy spectacular fishing. Our tracking showed, however, that while this annual postspawn migration theory holds for white crappies, it doesn't for black crappies. After spawning, white crappies quickly departed spawning areas and moved to deeper water near secondary river channel ledges and submerged structure, while black crappies remained in the same type of habitat where they'd spawned. "As summer approached, we guessed that rising water temperatures (over 80°F) would push white and black crappies from shallow habitats toward cooler, deeper main-lake structure," he says. "Similar to our postspawn observations, white crappies proved us correct, while black crappies remained in shallow habitat. The few male white crappies that had remained shallow during the Postspawn Period joined others in deeper water, holding on deep flats and near river channel drop-offs and ledges. Deep river channels accounted for almost half of summer locations for white crappies." Many black crappies stayed in flooded brush, stumps, and aquatic vegetation, as shallow as 2 feet during the middle of the day. Other fish occupied brushy shallow flats. "Both species showed strong fidelity to their chosen summer habitats, as few fish shifted habitat types," Oster says. That's important news for anglers, because during stable summer conditions, schools of fish are likely to remain in the area for extended periods. Modifications in presentation may be needed but location should remain rather constant. "Once summer arrives, most white crappies have established home areas near river channels, offshore ledges, and deep flats," he says. "Black crappies, however, prefer shallow flats and near-shore edges of aquatic vegetation and flooded timber. For both species, summertime movements are slight, so you may have to search for schools of fish. But once located, several crappies can be expected if you find the right presentation." Large rivers tend to be overlooked by anglers as crappie-fishing opportunities, yet they can provide qualty fishing for slabs that can rival lakes and reservoirs. Tracking studies on large rivers have mostly focused on identifying wintering habitats, as finding suitable wintering sites is critical for a number of fish species living in rivers. Many species don't tolerate current in cold water, especially in the main river where temperatures can plummet to below freezing, so current refuges become critical overwintering habitats. Backwaters serve as ideal wintering areas, but many backwaters have become degraded through siltation and other human modifications. Biologists at the Iowa Department of Natural Resources have been tracking crappies in pools along the Iowa portion of the Mississippi River since 1999. The goal is to identify the requirements of wintering crappies to help guide habitat management on the river. Mike Steuck and Kirk Hansen say that their research stems from previous findings by Iowa biologist John Pitlo, who observed many largemouth bass returning to the same backwaters each year. Steuck has been implanting radio transmitters in black crappies in fall, following their movements over winter, until transmitter batteries expires, about 6 months. "In summer, crappies are scattered and use a variety of habitats such as side channels and other areas off the main navigation channel," he says. "Then as fall arrives, crappies vacate summer areas and begin to stage closer to the entrances to backwaters. These are good areas to search for fall crappies. "Water temperatures falling below about 50°F que movements into backwaters. Some fish move in later, and others earlier, depending on the suitableness of the backwater as wintering habitat. In some areas crappies don't move in until they need to. The best backwaters have ample dissolved oxygen and no current. The deeper the better. Those at least 6 feet deep tend to be used more." Deeper water in ice-covered backwaters allows slightly warmer water near bottom, up to about 39°F. Locating structure and cover is a key to finding backwater crappies in winter. "The crappies are cover oriented," Steuck says, "with an affinity for snags, weeds, docks, and pilings, depending on what's available. In one backwater they show an affinity for weedlines, in another they use marina areas, or you might find them around lotus and lily stems." Steuck and Hansen note that the river crappies are migratory in their annual habitat preferences, something that you typically don't think of as characteristic of panfish. Hansen has recently started another river tracking project supported by the U.S. Army Corps of Engineers. This study also contributes to identifying critical habitats and crappie behavior. The transmiters Hansen is using have a battery life of up to 400 days, so individual fish can be followed throughout a full calendar year and beyond. A study by biologists Brent Knights and Barry Johnson of the U.S.G.S., in conjunction with Mark Sandheinrich of the University of Wisconsin-La Crosse, reveals that wintering crappies (they also studied bluegills) in the backwaters in Pool 5 of the upper Mississippi River can move quite a bit. River backwaters can be environmentally unstable. Current speed and dissolved oxygen (DO) can fluctuate frequently, while temperatures of 0°C (32°F) are common in winter — representing the coldest water that crappies experience anywhere. "When DO first decreased below 2 parts per million in Third Lake in December, bluegills and black crappies moved out of this lake and into areas with higher DO," the study states. Not only does this study show crappies move to find better habitat in extremely cold water, it suggests that 2 parts per million of DO might be the lower limit of tolerance for crappies in winter. "Areas with current velocity greater than 1 centimeter per second (cm/s) were avoided by bluegills and black crappies in our study," the document continues. "Avoidance of current would reduce energy expenditure and possibly improve over-winter survival of fish that depend on stored energy to meet metabolic requirements. Another possible explanation for avoidance of current may be that black crappies are unable to maintain their position for extended periods at current velocities exceeding 1 cm/s when water temperatures are near 32°F." The study goes on to point out that the swimming ability of black crappies in the laboratory is "uniformly poor" at temperatures of 39°F or below.